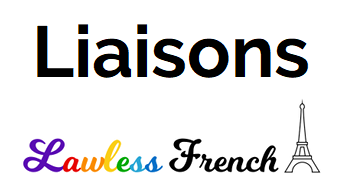 Some French liaisons in front of a vowel or h muet are optional, so it’s up to you to decide whether to pronounce them. However, that decision matters: more liaisons means more formal speech, so fewer liaisons obviously means more informal, possibly even familiar speech. Each sound file includes the phrase pronounced with and without the liaison. * Note that if you don’t make a liaison with the normally silent s at the end of livres and hommes, the always pronounced vr and m still require enchaînement.